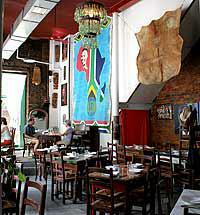 Madiba is a South African restaurant that offers a unique experience and cuisine on its own. Their moto is "A Place of Love. Since 1999" and the restaurant is located in Brooklyn. Madiba pays homage to Nelson Mandela. Their concept is based on the traditional dinning halls of the townships in South Africa. A large portion of the proceeds from the restaurant are given back to local communities in South Africa through a number of African charities.